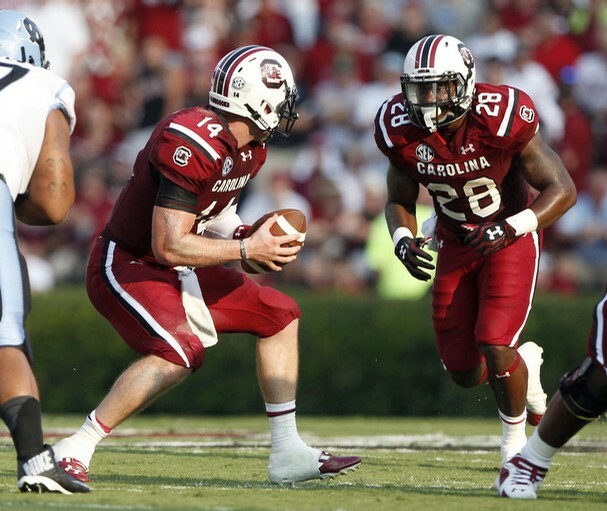 What we believed on August 28: Jadeveon Clowney is a Heisman candidate. Reality on Nov. 8: Jadeveon Clowney is most certainly not a Heisman candidate. I’m even beginning to wonder where he will land on postseason All-SEC teams, if anywhere. Now, we all know he was hyped during the offseason beyond any level he could ever achieve, but his production has been below anything we would have imagined two months ago. Yes, he has nagging injuries and offenses have successfully schemed against him, but the season for him individually has been a disappointment. Fortunately, JD has proven to be a team player and seems to have taken more of a leadership role as the season has progressed. With four, and possibly five games left, I think he still has something spectacular in store for us. Related: as Twitter followers @NateLord53 and @Aaronbost12 pointed out, Chaz Sutton was supposed to benefit greatly from all the attention Clowney would get on the field and have a monster season. While he has played better of late (see two big plays on Missouri’s final, ill-fated overtime drive), he has disappeared for long stretches this season. What we believed on August 28: Connor Shaw and Dylan Thompson will split time at quarterback. Reality on Nov. 8: Connor Shaw is the unquestioned leader of this football team. Sure, it sounded like a novel idea back in August. Last season Dylan Thompson had played great against Clemson, and had finished the game-winning drive in the Outback Bowl that Shaw had started, so he deserved some playing time, right? But when given a chance this year, Thompson threw a momentum-shifting interception against Vanderbilt, and had a lackluster performance in relief of Shaw at Central Florida. When Thompson started at Missouri and couldn’t put points on the board through 2 ½ quarters, we had to turn to an injured Shaw to pick us up off the deck and engineer one of the great rallies in South Carolina history. Don’t get me wrong, I love Dylan Thompson and can’t wait for him to lead the Gamecocks next year. I think he’ll be great. But this is without a doubt Connor Shaw’s team. What we believed on August 28: Georgia and Florida are our biggest competition in the East. Reality on Nov. 8: Missouri and Georgia are our biggest competition in the East. When a mostly healthy Georgia team beat us in early September I thought our chances to win the East were dead. After all, when looking down Georgia’s schedule, who was going to beat them? But no one could have predicted Georgia, along with Florida, would be decimated by so many injuries over the course of the season. At the same time, no one predicted Missouri’s quick rise to the top of the East. With Georgia’s victory over Florida last weekend, it appears to be a three-team race to Atlanta, and given our schedule advantage, I still like our chances. What we believed on August 28: We don’t have a go-to wide receiver. Reality on Nov. 8: We don’t have a go-to wide receiver. But wait, on August 29 I thought that was a bad thing. It turns out the wide receiver corps has been very solid this year, with Shaw and Thompson spreading the wealth between Bruce Ellington (32 catches, 5 TDs), Damiere Byrd (29 catches, 4 TDs), Nick Jones (25 catches, 4 TDs), and, when he’s not in street clothes, Shaq Roland (11 catches, 3 TDs). Also of note, Kane Whitehurst has two catches for two touchdowns. The go-to-receiver by committee has worked out well for us, and the good news is (barring something unforeseen), they will all be back next year. What we believed on August 28: Our tight ends will be serious offensive weapons. Reality on Nov. 8: Our tight ends have mostly been a non-factor. This has been as puzzling as anything we’ve experienced this year. Busta Anderson had proven himself as a quality threat at tight end over his freshman and sophomore seasons, and the reports of Jerell Adams size, speed and athleticism had us drooling to get him on the field. With the uncertainty at wide receiver, we were comforted by the fact we had these two guys. Throw in the talented Drew Owens and we had perhaps the best set of tight ends in the SEC. But through nine games the three combined only have 25 catches and one TD, and to my knowledge no one has given a good explanation as to why we haven’t seen more production out of the position. Much like the Clowney situation, I expect Anderson or Adams to have at least one breakout game over the last three weeks. What we believed on August 28: Mike Davis has a chance to be a decent running back. Reality on Nov. 8: Mike Davis is a spectacular running back. We’ve said a lot about him in this space and talked a lot about him on our podcast, but Davis has been the biggest and most pleasant surprise of this season. We knew he had potential, but we had no idea he would have the best combination of size and speed we’ve seen at USC since George Rogers. He will be a first-team All-SEC back, and will probably make some All-America lists. What we believed on August 28: Our linebackers are talented but will struggle because of their inexperience. Reality on Nov. 8: Our linebackers are talented but have struggled because of their inexperience. But the light appears to be coming on for most of them. The last few weeks they have been playing faster and making fewer mistakes. Skai Moore is a star in the making. What we believed on August 28: We will have several easy wins this year. Reality on Nov. 8: We have had one easy win this year, and might (MIGHT, I say) have one more. As Spurrier said after one of our early, root-canal wins, it’s just who we are. For whatever reason, we have trouble putting teams away. The good news is, most of the time, we eventually do put them away. I thought early on that our kicking game would be a nightmare. But I think Fry has done a wonderful job on XPs and FGs. Kickoffs are mostly good – though like you guys say, one out of every 3 or so goes out of bounds (inexcusable). Punting is still a work in progress. But no matter how bad it gets – it still isn’t a -7 yard Courtney Leavitt special.